I am being asked to analyze the recently announced Trump tax reform proposals. However, at this early stage in the legislative process, it is far too premature to assume that these proposals will ever become real tax laws. There are some very good ideas in the Trump tax reform proposal; but they are already under vicious attack by the DemonRats and RINOs, who are revising actual history and spreading outright lies about the effect of tax rate reductions. Opinions as to whether Trump will be able to get his proposal through the legislative process are all over the board. As I have already told some people, if it starts to appear that the Trump proposal garners enough support in Congress to have a good chance of passing, I will most definitely spend some time analyzing it. Over the past 40+ years in the tax profession, I have seen far too many pie in the sky tax reform proposals that too many people wasted time taking seriously. Back in the 1980s, I even commissioned a poster to illustrate the metamorphosis appetizing sounding tax reform proposals go through as they work their way through Congress. It’s no different than our body’s digestive process. Scrumptious apple pie ends up looking and smelling completely differently. You can still see a small version of that poster here on my main website. 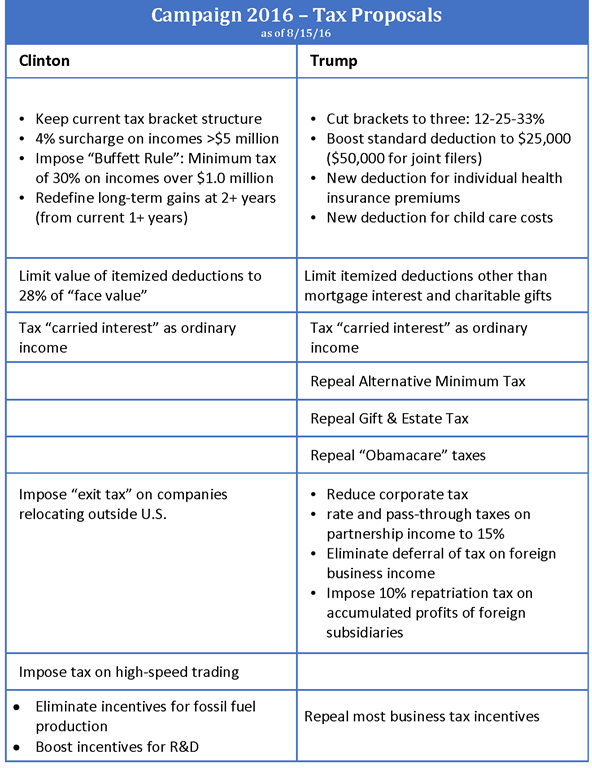 As is their practice every four years, the masterminds at TaxCoach have prepared a side by side chart comparing the tax related campaign promises by the two main presidential candidates. This is for entertainment purposes only. 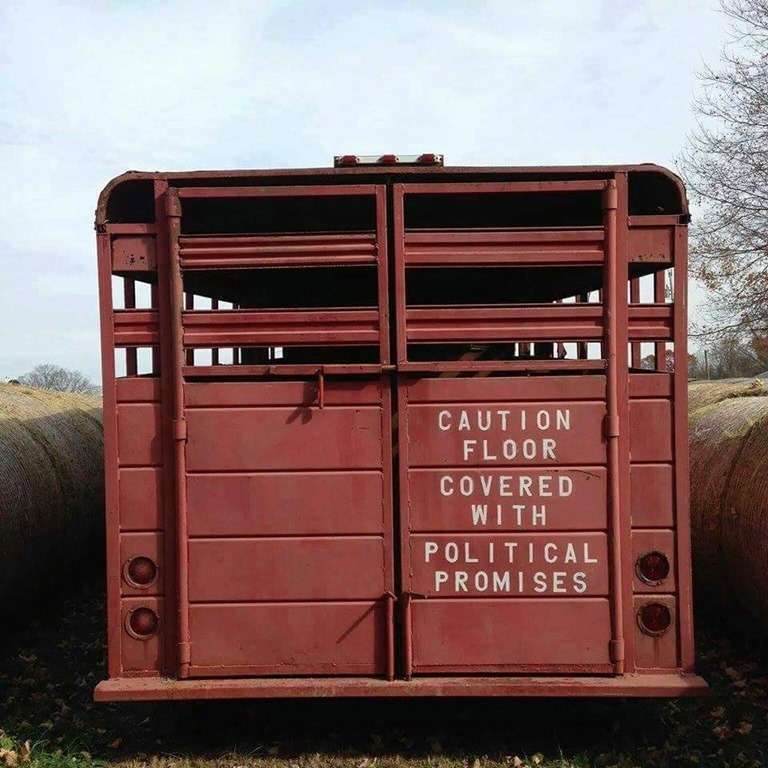 I’m not expecting too many people to base their election preferences on this because, as we all know, campaign promises rarely turn into reality. In the sense of fairness, I need to remind everyone that there will be more than two choices on the November presidential ballot, which is great for those who can’t stomach voting for either Trump or Hitlery. Gary Johnson of the Libertarian Party will be on the ballot in all 50 states and may even be in the big debates if his name is included in more preference polls. His tax policy can be found here on his campaign website. Governor Johnson advocates for the elimination of special interest tax loopholes, to get rid of the double-taxation on small businesses, and ultimately, the replacement of all income and payroll taxes with a single consumption tax that determines your tax burden by how much you spend, not how much you earn. Such a tax would be structured to insure that no one’s tax burden for the purchase of basic family necessities would be increased. To the contrary, costs of necessities would likely decrease with the elimination of taxes already included in the price of virtually everything we buy. Many leading economists have long advocated such a shift in the way we are taxed, and Gary Johnson believes the time has come to replace our current tax code, which penalizes the savings, productivity and investment we so desperately need. Stop special interest loopholes. Reward responsibility. And simplify our tax code. It’s been a while since I have mentioned the benefits for tax pros of subscribing to the TaxCoach service. It has actually become more useful every year, as they continually add new features. The weekly call-ins among the TaxCoach members are extremely informative. Any tax pro wanting a great reference source for tax saving ideas, as well as methods of expanding their practice should check out TaxCoach. My two main tax reference sources for the past few years have been TaxCoach and TheTaxBook as I let my subscriptions to the many other ones lapse. 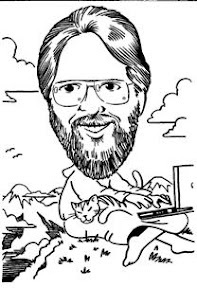 With every year bringing new free tax services and DIY software, I have to reassure other tax pros that none of those can ever replace the knowledge and expertise of us, especially when our rulers are continuing to make everything more complicated. I hate to keep repeating myself, but this is just like the poster I created decades ago, illustrating how “Tax Simplification” laws work in the real world after having been created by the insane morons in DC. PJ Media has posted this 24 minute panel discussion on the abhorrent state of our tax system, with the very accurate title of Death By Taxes: The US Income Tax Is Government Theft. It’s the perfect thing to watch as the infamous Tax Day approaches in this country. As always, the media are flooded with last minute tax tips. Here’s the best tip if your tax returns aren’t already finished. Work with a professional tax practitioner and file an extension (Form 4868) that will give you six more months to properly prepare and file your tax returns. Trying to rush things together at the last minute is a recipe for disaster, often with mistakes that can’t be undone later on.